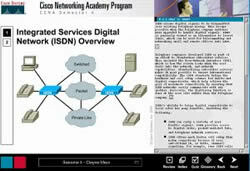 The first course concentrates on learning the fundamentals of the generalised OSI networking model. In addition, we examine how local area networks function - connections, collisions, signalling standards and media. Practical lab work includes cable making, design, terminal configuration and protocol analysis. The second course concentrates on router setup and configuration, with special attention to subnetting practice. TCP/IP is studied as an example of a "real-world" networking protocol. Practical lab work is centred around the router labs and involves regular configuration and troubleshooting. 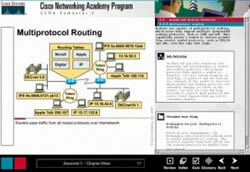 Course 3 is an in-depth introduction to the workings of real local area networks. In this course we examine LAN design, switch functions, Novell Networks, network security and network management principles. 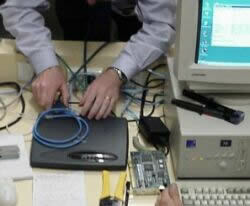 Practical lab work includes work with LAN switches and routers to create secure, well designed networks. Students will also commence the Threaded Case Study - an analysis of a statewide distribution system. 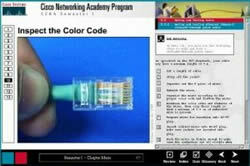 The final course examines issues and protocols associated with the use of Wide Area Networks. ISDN and Frame Relay are examined at length along with some tools for network design and development. Practical lab work centres around advanced security techniques and the Threaded Case Study.